Flexstar® GT 3.5 herbicide is specifically formulated to combat weeds that are difficult to manage with glyphosate alone, or are resistant to glyphosate and ALS-inhibitors. It contains 2 leading active ingredients and delivers 2 effective sites of action for use in soybeans and cotton. Flexstar GT 3.5 contains Isolink® II Technology, a unique adjuvant system designed to optimize the systematic activity of glyphosate and the contact activity of fomesafen. 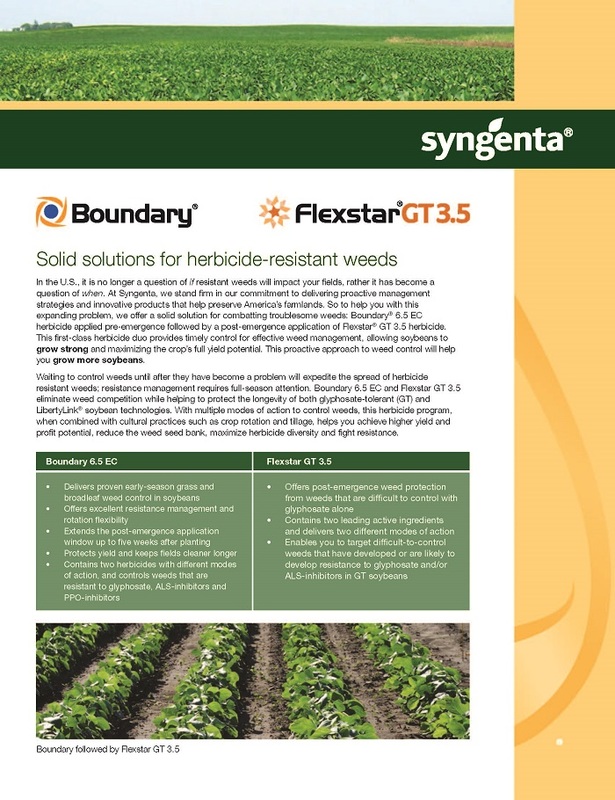 In soybeans, Flexstar GT 3.5 can be used as part of a full-season weed management system when applied as a follow up to Boundary® 6.5 EC or BroadAxe® XC herbicides. This image series shows the superior weed management provided by Boundary® followed by Flexstar® GT 3.5 (right) vs. untreated (left) and Fierce® (center). Source: Syngenta, 2016. The effectiveness of a strong full-season weed management program is even more apparent during bare ground trials, as shown here. Top left: No pre-emergence herbicide with a post-emergence application of Flexstar® GT 3.5. Top right: Envive® followed by Flexstar® GT 3.5. Bottom left: Valor® followed by Flexstar® GT 3.5. Bottom right: Boundary® followed by Flexstar® GT 3.5. Source: Syngenta Grow More™ Experience site, 2016; Kinston, NC. One of the keys to weed resistance management is the use of multiple effective sites of action. The difference in weed control is clear when comparing a glyphosate-only application (left) to the 2 effective sites of action of Flexstar® GT 3.5 (right). 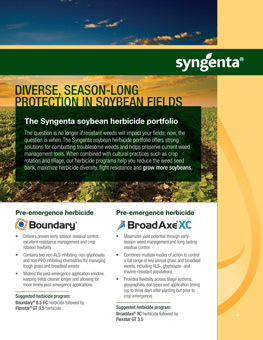 Source: Syngenta, 2013. Boundary®, Flexstar®, Isolink® and the Syngenta logo are registered trademarks of a Syngenta Group Company. Third party trademarks are the property of their respective owners.